Capture ideas at the moment of inspiration and create songs easily with a riff-based workflow, loop recording, automatic track creation (24 tracks), 7 guitar-oriented effects, support for amp models (AmpliTube, PodFarm, StudioDevil and others), 9 InstantDrummers (expandable), REX player, ReWire mixer, export and more. Stay in the creative flow with tools that look like gear, and create complete songs without putting down your guitar! Notice: RiffWorld.com, RiffCaster song posting, and RiffLink online collaboration have been disabled. See RiffWorld forum for details. InstantDrummer: Tempo-synchronized backup drum recordings with adjustable intensity, variation and tempo. No need for tedious drum programming. 9 InstantDrummer sessions by top drum content companies (worth $4.99 each) are included with RiffWorks Standard. Find more than 100 InstantDrummer sessions to use with RiffWorks Standard. These items may be conveniently downloaded from your Sonoma store account downloads page, installed and activated on up to 3 computers (Mac and/or Windows) using the same user name and password. Sonoma 7 VST Plugin is no longer supported. 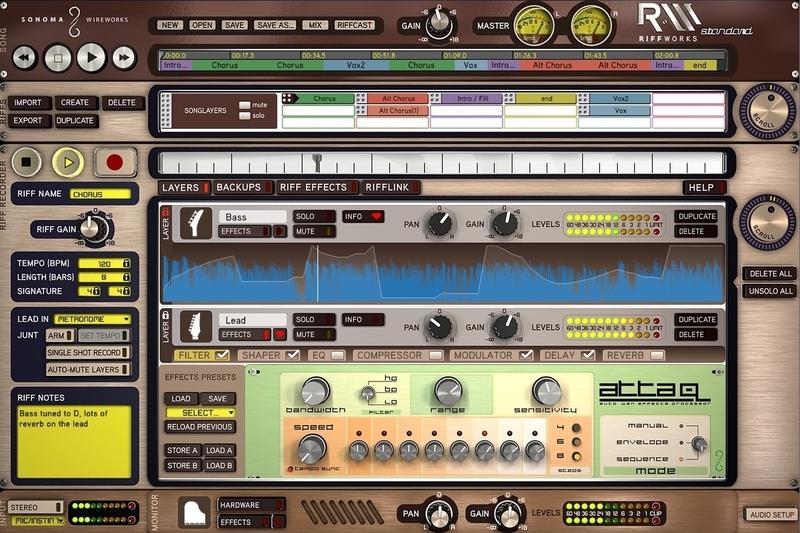 RiffWorks T4 (free) and RiffWorks Standard Feature Comparison.